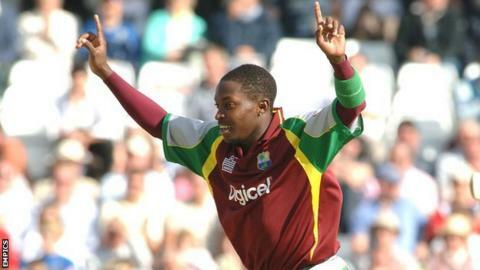 Leicestershire have held talks to sign Fidel Edwards for the 2014 season but director of cricket Phil Whitticase says a deal for the experienced West Indies paceman is "highly unlikely". Whitticase expects the 31-year-old to look to make the most of the lucrative Twenty20 competitions around the world. "It will probably be highly unlikely we would be able to get him due to his other commitments," Whitticase said. Edwards has played 55 Tests and 50 one-day internationals, taking 225 wickets. He has also taken 16 wickets in 20 T20 internationals for West Indies. Whitticase added: "Fidel is a player that has been mentioned. "But we are aware of the opportunities these players have. There is the [IPL] Indian Premier League, the CPL [Caribbean Premier League] and other T20 commitments, and I am pretty sure that is where Fidel sees his career going."